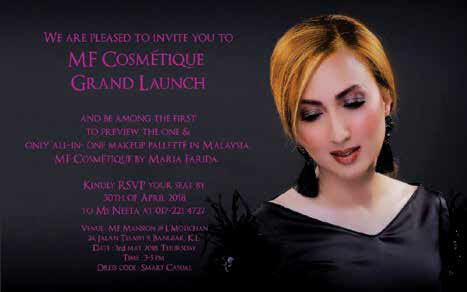 INTI students were picked to design and produce clothing for the video launch of MF Cosmetique, in collaboration with a haute couture fashion house – Royale Demure. Two final semester INTI students, Nicole Teoh Theng Yee and Denise Hor Mei Yoke were selected as Royale Demure designers during their final project assessment. The Royale Demure is the first crowdfunding platform in Malaysia that is specific to fashion design collection. The students were selected to work on the MF Cosmetique launching project, where the requirement was to design a blouse for the video launch. The video launch was a success. The students had the chance to learn designing clothing for the event, participate and experience in the launching activities. Both of them are currently having their collections, KOI TCC and Dee, pledged on Royale Demure. Through this collaborative opportunity, the two students got to start their collection on Royale Demure with minimal cost. They also managed to gain exposure through working and collaborating with different stakeholders such as the client, models, photographers, the video shooting team and more. The Yayasan Sime Darby Arts Festival (YSDAF) appointed INTI’s Center of Art and Design to be the 2018 education partner. This collaboration project saw a participation of students from INTI International College Subang. They were from the Bachelor of Arts (Hons) Interior Design, Bachelor of Arts (Hons) Graphic Design, Foundation in Design, Diploma in Interactive Multimedia with Animation Design and Diploma in Fashion Design programmes. YSDAF is the largest free-for-all arts festival in Malaysia. It is presented by Yayasan Sime Darby at Kuala Lumpur Performing Arts Centre (KLPAC), and takes place once every two years. The YSDAF is a 2 day-event, held in August 2018, whereby 17,000 people had visited the 350 art activities. 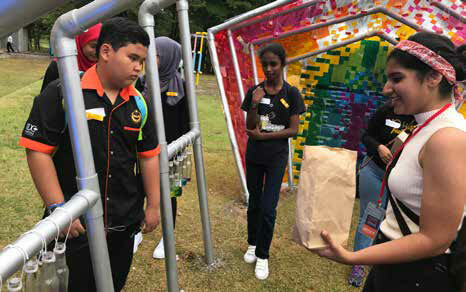 INTI students were required to observe and discover the potential of using art and design to connect to the mass audience based on the theme: YOU + ME + ART + SENSES. They were needed to use different mediums and materials to create outdoor installation, indoor installation and furniture at the existing site topography at KLPAC. Students applied cross-disciplinary knowledge and collaborative skills into this project, in which they have learned in class. The whole project was divided into four areas which were workshops, indoor video installation six outdoor installations and showcase of meaningful projects that done by the students in the past. The project has encouraged more crossdisciplinary activities, to develop students’ crossdisciplinary knowledge and collaborative skills. The students were able to demonstrate increasing autonomy, professionalism, critical awareness, and be responsive to on-going feedbacks while managing self-learning, time and resources. They also managed to conduct research methodologies by using a broad spectrum of sources, and accurately deploy established methods of analysis, and inquiry to clarify the intent. As an end result, students successfully produced a significant body of creative work, and supporting research that met the highest professional standards – by using a range of media and techniques that were appropriate to the practice. Bachelor of Arts (Honours) in Interior Design, in collaboration with the Sheffield Institute of Arts, Sheffield Hallam University, United Kingdom. 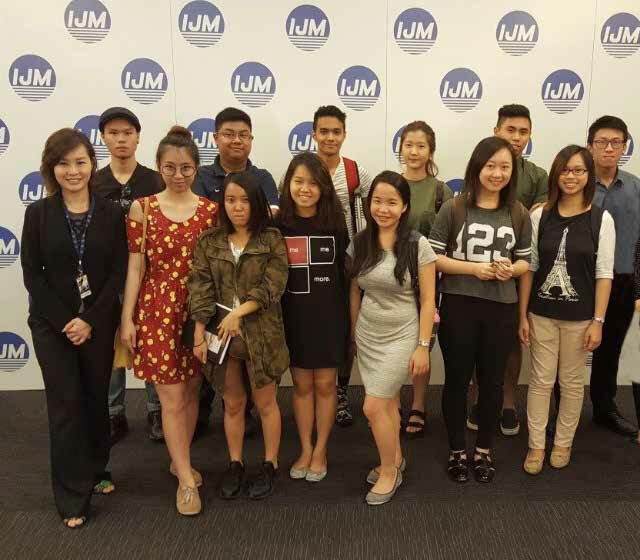 13 second year students from the Bachelor of Arts (Honours) in Interior Design, in collaboration with the Sheffield Institute of Arts, Sheffield Hallam University in the United Kingdom, undertook the challenge to design IJM Corporation Berhad’s (IJM) Innovation Lab to inspire out-of-box thinking, collaboration and sharing amongst its employees. The students were also required to include a proposal on the digital technology to be used at the Lab. The 13 students put their minds together and designed an Innovation Lab that was humancentred for IJM and as such, they needed to obtain an in-depth understanding on the different individuals who would have access to the Lab. The Lab would be used by IJM employees to identify design trends, recruitment, and innovative solutions to complex problems. IJM’s core business activities encompasses construction, property development, manufacturing and quarrying, infrastructure concessions and plantations, spread across 10 countries. Conducted in slightly less than two months, the students explored new possibilities in terms of design trends to drive an innovative thought-process in terms of space usage, discover issues within the design scope as well as the relevant information and communication technology that would support the design proposal. Throughout the project, the students met with the employer several times for thorough briefings to ensure they were on the right track and obtained feedback on their progress. Guided by their lecturer, they also carried out interviews and surveys with specific individuals in charge to obtain more detailed information. Several site visits and analysis were also conducted as this allowed them to record, measure, study and fully understand the space they had to work with. Once this was completed, they had to also pitch their ideas to gain client buy-in, as well as gain additional information that would help them enhance their design further. The overall exercise allowed the students to apply appropriate research strategies, analyse the research findings and interpret the results to help them generate innovative designs to suit the needs of the employer. They engaged extensively with the team from IJM, learnt to anticipate and be more accommodating to changes made by the employer, quickly adapted to work within environments that were full of uncertainties and at the same time, resolve challenging design problems within tight timelines. As a result of their hard work, the employer was happy with the ideas presented as it demonstrated the team’s understanding of effective space usage and it also helped build the employer’s reputation as an organisation that values divergent-thinking, constructive criticism and collaboration. The time spent on this project allowed the students to develop a work portfolio as well as a wide network of contacts, all key aspects that would increase their employability in the future. Bachelor of Arts (Honours) in Interior Design, Bachelor of Arts (Honours) in Graphic Design in collaboration with the Sheffield Institute of Arts, Sheffield Hallam University, United Kingdom; Diploma in Graphic Design, Diploma in Fashion Design and Diploma in Interactive Multimedia with Animation Design. A total of 42 students from various design disciplines- Graphic Design, Fashion Design and Interactive Multimedia and Animation were tasked with creating a series of branding items to strengthen or rebrand Moo Cow Frozen Yoghurt as a “functional food” to a majority of their customers, who are women between the ages of 25 and 34 years old. Throughout the 10-week project, the students collectively harnessed their creative skills, developed a proper understanding of designing in a business context and gained exposure to work projects. The project complemented academic instruction, combining theoretical knowledge and practical application across different design disciplines. Working under immense pressure, as the project had several components to it, they worked across several groups and supported each other in solving design problems based on their area of specialisation. 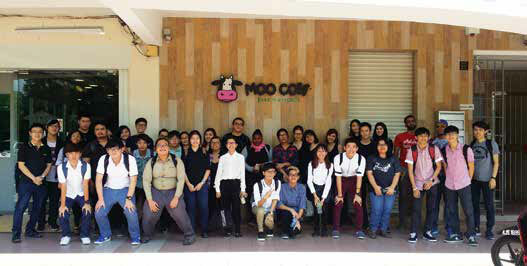 Over the 10-week period, the students conducted visits to the Moo Cow head office and factory, followed by briefings by its founder, Clifford Too, to obtain information on the industry and customers. They also carried out their own research and developed their concepts, all the while closely monitored by their lecturers. This project was unique as they engaged many times with the founder of the company, deriving useful insights into Moo Cow’s history, brand proposition and past experiences. The project delivered a powerful experience to these students as they learnt how to manage information, process feedback and deliver solutions according to the needs of the employer. Although it was an intense period, the students delivered impressive outcomes, with three groups winning the first and second prize for Best Design Award and the Best Team Presentation Award. The employer was happy with the fresh ideas, level of professionalism and abilities demonstrated. The students found the overall experience very valuable as they had the opportunity to work with the founder of a well-known Malaysian company and gain first hand market insights. Although the students were from different design courses, they learnt to think beyond their academic course of study, work as a team and enhanced their communication and soft skills – all of which prepared them for the work force in the future.